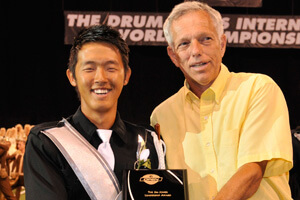 John Lee and DCI Hall of Fame Member Gene Monterastelli. Every year at the Drum Corps International World Championships, the DCI Hall of Fame, Friends of DCI and other organizations and committees recognize drum corps members for their hard work, dedication and exceptional service to the activity. The Jim Jones Leadership Award, named after the DCI Hall of Fame member and founder of the Troopers, has been presented to outstanding drum majors since 1997. Once again in 2010, a committee of Hall of Fame members selected a drum major from both the World and Open Classes to receive this honor. The World Class recipient is first-year Madison Scouts drum major John Lee who said winning the Jim Jones award was "a cherry on top" of his 2010 drum corps experience. Explaining his leadership style, Lee said: "The number one thing…is to find the individual meaning of confidence and devotion to something, and find what that means to you. For instance this year, my heart was devoted to the Madison Scouts, and I think in that aspect, perhaps my leadership was able to come through." Lee has studied music education at California State University of Sacramento, and among his other accomplishments he has served as Director of the UCSD a'capella group, the Tritones, speaker for "Ambassadors of Music" at UCSD, and performing in the La Jolla Symphony Chorus and Orchestra. 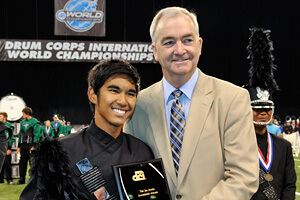 Eddie Pineda with DCI Executive Director Dan Acheson. "This is such a beautiful activity," Lee added. "I just have to say to all those who are coming back next year, and then several years to come, to truly enjoy the experience. It's easy to take for granted during 60 days on tour and hundreds more of rehearsals, but you've got to enjoy every moment. It's one of those things you're not going to be able to do forever." Eddie Pineda of Blue Devils B was recognized as a drum major in the Open Class. "It is such an honor to win that award," he said. Pineda is only the third Open Class drum major to receive the Jones Award, and the first from the Blue Devils organization since the very first recipient in 1997, James Gulke. Pineda studies psychology at California State University of Sacramento. Several scholarships were also awarded to recognize outstanding corps members and to help them continue their marching and music endeavors. 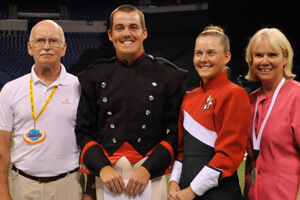 The Jim Ott scholarship was created in memory of the renowned drum corps brass arranger and instructor, and is awarded to a corps member pursuing higher education in the music field. This year's Ott scholarship, presented by the San Joaquin County, Calif. nonprofit, Sponsors of Musical Enrichment, went to Anna Thompson of Carolina Crown. with Patty and Ken Richardson. The George Zingali Scholarship, honoring the late visual designer famous for his legendary drill charts with moves like the famed "Z-pull," goes to outstanding color guard members. The 2010 award, presented by Hall of Fame member George Oliviero, was awarded to three members: Carrie VanDoren from Carolina Crown, Lewis Shingleton from Bluecoats and Tracey Nettler from the Blue Stars. Since 2007, contributions from the Friends of DCI have provided for the "Friends of DCI Scholarship Program," which awards educational funding to corps members pursuing higher education in any field. This year's recipients are Matthew Solis from the Blue Devils and Todd Harris from Phantom Regiment. Finally, the Richardson's Scholarship, created by Friends of DCI members Ken and Patty Richardson, was awarded to Ann Sullivan from Santa Clara Vanguard and Michael Poulin from the Spartans. Ken and Patty Richardson created the scholarship for corps members who are pursuing degrees in music.